WILLIAMSBURG, Va. -Need to know the wait time for Busch Gardens’ Griffon roller coaster? The theme park has an app for that. 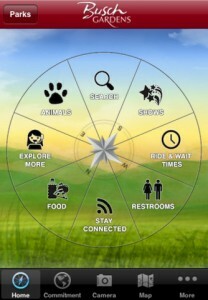 A new Busch Gardens mobile app, available for download at the App Store on iTunes, sends park-specific information like restaurant menus, show schedules and restroom locations right to a guestís smartphone. An interactive map lets GPS-compatible phones navigate the park with ease so guests can spend less time rushing around the 150-acre park and more time enjoying its attractions. The app is currently available for the iPhone, but an Android-based version will be available soon. This is the first mobile application offered by the Williamsburg theme park. The mobile app is being deployed to complement the park experience and provide up-to-the-minute details for all of the park’s family-friendly activities. – Includes Florida and Virginia locations. – True GPS navigation provides a highlighted path to your destination. – Interactive park map with search. Find nearest restroom, place to eat, ATM and more. – Up-to-date wait times on rides, plus ride-height requirements. – Features show times for each park’s spectacular shows. – Get basic park info, calendar with operating hours, weather forecast and driving directions. – Stay up-to-date with each park’s Facebook and Twitter feeds. – In-app camera. Take pictures of your trip without leaving the app. – Learn about our animals and their conservation status then get directions to connect with them in person. – Personalize your day with guided tours and more. Put both Busch Gardens parks in your pocket! Download today. Posted in: Busch Gardens Theme Parks.